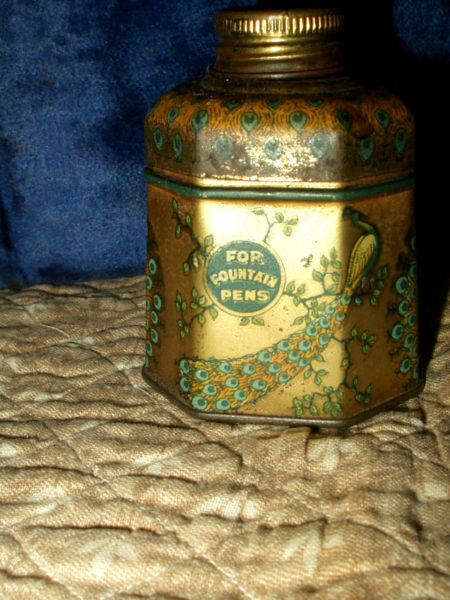 Here’s a very cool advertising ink well, for fountain pens, from a time long ago. Dating about the 1920’s, perhaps earlier, a Signet Peacock Blue lithographic tin and glass inkwell. Manufactured by Russia Cement Company, Gloucester, Mass. Makers of LePage’s glue. The hexagon tin features peacocks on the panels. A strutting peacock and another, with the feathers extended, grace the sides. The tin lid unscrews to reveal the glass container. A colorful and delightful inkwell to add to a collection. This one would not be a disappointment.